Bright Side of Life Computer Consultancy B.V.
Want to find new social connections or friends who think like you? Need help with a Dilemma? Want to share your opinions? 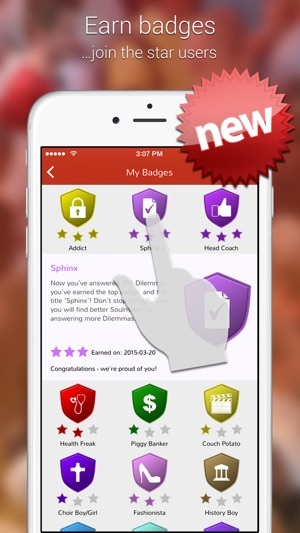 DilemmaMatch is the perfect app for you! Each and every person sees the world differently and from a different angle. People have different beliefs, hobbies and opinions. Imagine you could find people who think like you, and share your interests. By answering Dilemmas, or even adding your own, DilemmaMatch will bring you in contact with these people across the street, in the next town, or across the world. 1. LOGIN using your existing Facebook account (or create one). 2. CHOOSE your interests... sort our list of subjects e.g. 'Fashion & Lifestyle' and 'Sport and Leisure' into your preferred order. 3. ANSWER Dilemmas... once you have answered at least 20 we will start looking for matches. 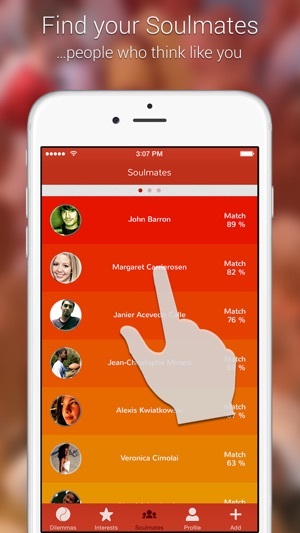 People with the same or similar answers will be shown in your list of Soulmates. The higher they score the better the match! This list will continually change, depending on the choices made by you and other DilemmaMatch users. 4. 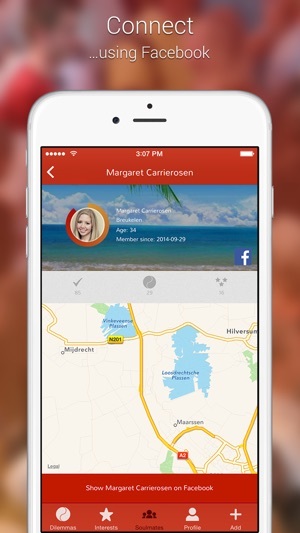 CONNECT straightaway using Facebook and make new friends – what could be easier? 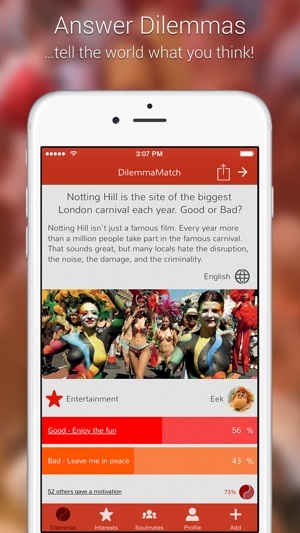 DilemmaMatch is a social app that helps you socialize, find and connect with new friends in a fun and entertaining way, and create lasting friendships worldwide! In the DilemmaMatch app you answer Dilemmas, motivate your opinions, comment and react to other users’ opinions. 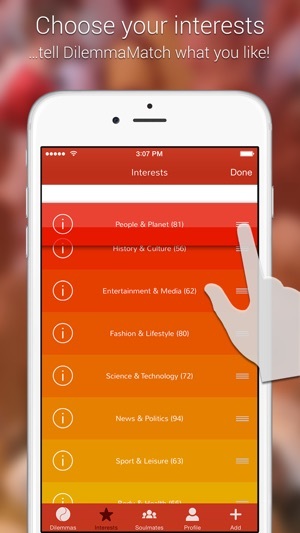 The app compares your interests and responses to Dilemmas with other people. Based on your decisions and DilemmaMatch’s unique matching strategy, it then finds new friends – and helps you get in touch via Social Media. All DilemmaMatch users can connect, share answers to dilemmas, motivate their answers and discover new like-minded friends. Premium users (available as in-app purchase) can also create dilemmas containing images, audio and movies, helping you find people who share your thoughts. The latest DilemmaMatch contains many new features, including a completely new Add Dilemma screen, and super smart language translation. You can also match with your Facebook friends, earn badges, revisit your answers, give multiple motivations, and vote/like other users motivations. Single tap to choose Dilemmas by Interest, or to get in touch with Dilemma Creators. 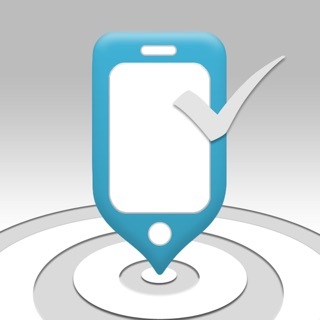 All of these features and many more are in the latest release. And don't forget, you can DilemmaMatch with your friends on other mobile platforms!